Is he back? Who? Tiger? No, Padraig Harrington. It’s too soon to say that Harrington has started to mine the kind of form that will make him a force at Augusta in a month’s time, but a four under 68 left the Celtic Tiger just four shots off the lead at the halfway stage of the WGC-CA Championship in Miami. And Tiger? The rumour mill is devouring itself on the world No 1’s return to action. With his coach Hank Haney spotted working with him at Isleworth, spin doctor Ari Fleischer believed to be helping him plan a comeback strategy, everyone’s wondering when the circus will open for business again. The Tavistock Cup? The Arnold Palmer Invitational? The Masters? But he didn’t have long to reflect on a day of dramatic changes in wind direction before the TW question came up. Q. When Tiger comes back, which seems imminent at some point, either in a couple of weeks or three or four weeks, how do you think he’ll be received by A, the fans, and B, the players, and if you get paired with him, what would you say to him on the first tee? That’s three questions in one. PADRAIG HARRINGTON: Well, I think that would be a strong word, in fairness. I think you’re going to have all sorts. Like there’s no doubt there’s a lot of people, a lot of the solid fans who are disappointed, and I don’t know how they are going to react. There’s no doubt there’s going to be — you know, I wouldn’t have said that the FBR Open or the Waste Management Open should be his first tournament back a couple of weeks ago, it wouldn’t be one of those events. But I think in general, people will be curious. It will be a bigger deal. Like you know, as I said, golf has held him in such high esteem and obviously with this whole thing, from a golfing standpoint, it has been disappointing. But you know, when you look at it, like I know people at home who have no interest in golf, and they are interested. They watch Tiger Woods interviews. There is going to be a bit more attention on it. It does make it a bit more — it makes it a bit more E! Entertainment, doesn’t it, rather than CBS. Getting back to the golf, Harrington knows that he rarely wins out of the blue. “I need to be in contention as often as I can. I have a tradition of usually, unfortunately for me, and anybody who is trying to follow me backing me, I normally warm up by getting into contention a few times. I don’t normally win out of the blue, no. It’s very rare. Winner or not this week, Harrington’s nicely placed in a share of fifth place with Soren Hansen, who’s under investigation for tax evasion in Denmark. 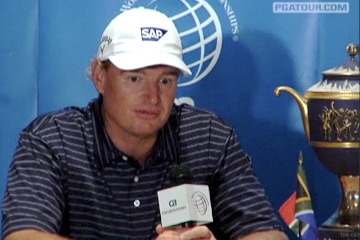 A resurgent Ernie Els (66) leads by a stroke on 10 under from Robert Allenby, who had a hole in one at the 13th in a 67. The Australian has had such an adventurous week that his scorecard is a patchwork quilt of colour coding - 3 eagles, 12 birdies, 13 pars, 7 bogeys, one double and just 49 putts. Harrington has been far more consistent - 10 birdies, 4 bogeys - though he’s not getting carried away and explained that he usually needs to get into contention once or twice before he wins an event. That said, he’s in no hurry to peak. Graeme McDowell bounced back impressively from his opening 74 with a bogey free 68 sending him soaring to 22nd place on two under. But Rory McIlroy, who insisted on Thursday that his loss of form has nothing to do with the back strain he suffered in January, struggled to a one over 73 that left him tied for 62nd in the 68 man field on six over. Masters favourites Tiger Woods and Padraig Harrington knocked some more rust off their games as Rory McIlroy ran out of adrenalin in the WGC-CA Championship at Doral’s Blue Monster. Ernie Els, the Rolls Royce of golf, looked every inch the classic model admired by all when he closed with an immaculate, six under 66 to win the WGC-CA Championship by four shots from his South African protégé Charl Schwartzel at blustery Doral. Padraig Harrington crashed spectacularly in his bid to help his spluttering season reach take of speed in the WGC-Cadillac Championship in Miami. But while he claimed that the triple bogey seven he racked up on the third hole in the final round at Doral’s Blue Monster did not hurt one bit, he’s definitely flying high when it comes to the management of his affairs.